Your bathroom may not be the most popular room in the house – but it could be! It’s the first place you go in the morning, it’s the room your family is always lining up to get into, and it’s where you go to relax when you need to unwind and shed the stress of the day. Whether your bathroom is small or large, it represents an oasis in your home. It also needs to be versatile, providing ample space for storage while supporting your design aesthetic. If you have a small bathroom, storage is even more important. Custom vanities and bathroom cabinets can turn even a small room into a marvel of practicality and style, staying true to your interior design while enhancing the functionality of the space. Custom vanities can provide you with all the storage you need to keep bathroom clutter to a minimum. Coupled with custom bathroom cabinets, you can have it all: space, style, and function, in all manner of configurations and design. We work with a wide range of materials that give you a virtually endless palette of possibilities for your bathroom cabinet design. From the warmth of natural wood to a bright, whitewashed cottage look, glossy modern veneers, glass, stone, or live edges, we can bring your vision to life. Whether you are renovating your master bathroom, updating your guest ensuite, or making your powder room more appealing, custom vanities and bathroom cabinets deliver great design while enhancing the overall look and feel of your home. Depending on the materials you choose, your reno may well raise the value of your home, too. Jim Farris Cabinets’ custom vanity cabinets combine contemporary styling with superior craftsmanship and creative storage solutions. Bathrooms are often small and sometimes oddly shaped, meaning that off-the-shelf cabinets often just don’t cut it. If you are the kind of homeowner who wants to maintain a flow of design throughout your home, custom vanities and cabinets are really the only way to go. Using state-of-the-art BIM and CAD technology, we render scale drawings of your bathroom design before we even start the job. This will give you the opportunity to visualize different materials, designs, and finishes in your space to make sure it is exactly what you want. Once the design is approved and finalized, we work diligently to bring your project to life. Our in-house craftsmen are some of Houston’s finest! Each and every person involved in the design, fabrication, and installation of your cabinets will be consulted at every stage of the project. This minimizes problems along the way and assures you of an expedient process from concept to completion. Using this design-build approach allows us to maintain agreed-upon timelines and stay within budget. We will work closely with you to make sure you are aware of your options so that you can plan for any challenges that may lie ahead. Ultimately, it’s about delivering on our promise to give you the bathroom you’ve always wanted, without compromise. Having custom bath cabinets built and installed has a wide range of benefits. First and foremost, it will maximize your available space – even when space is at a premium. In situations where your family is growing, you may suddenly have different needs. For instance, when it was just you on your own, you may have been okay with a medicine cabinet and minimal space in the vanity to store your personal items. Getting married and starting a family changes a lot of that, because suddenly you will need more storage, more shelf space, and you might want to make the bathroom a bit more functional. Updating the vanity and including built-in bath cabinets will give you ample room for linens and extra toiletries, and when your family grows, you’ll have plenty of space to store bath toys and baby’s bath accessories. Whether you are upgrading your bathrooms in conjunction with a bathroom remodel or if you are updating for practical or aesthetic reasons, Jim Farris Cabinets should be your first call. We’ve been crafting custom cabinetry in Houston since 1976, delivering superior quality and customer service you can always rely on. Call today to talk to us about your bathroom vanity in Houston. 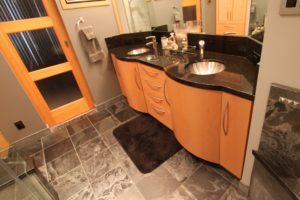 We would love to show you how custom vanities and bathroom cabinets can bring your vision to life.